This past June, Biscayne National Park released its new General Management Plan (GMP) to guide actions over the next 20 years in preserving and protecting the shallow water coral reef ecosystem (only living barrier coral reef system in Continental U.S.), mangrove forest, water bird colonies, fish populations and cultural sites all to insure a high quality visitor experience. (In 2014, the park’s visitor count was 525,714.) The Plan includes, among many actions, one to close over 10,000) acres (5-6% of whole Park) to anglers and commercial fishing in waters of Biscayne Bay in south Florida. Closing out anglers to such a large area is a very contentious issue in the self-proclaimed ‘sportfishing capital of the world’ that generates a lot of debate and controversy. Some claim the Plan is not backed by sound fish science including representatives from the State of Florida’s Fish and Wildlife Commission (FWC). Representatives of the agency said the state does not support the large closure and would only do so when it has been “scientifically demonstrated” that it works. It was reported that the FWC representatives maintain that the stocks of the fish species found in Biscayne Bay are in good shape collectively throughout state waters. The NPS focuses on the populations of the same fish but only inside the Park boundaries where their science indicates fish stocks are depleted and the corals reefs are experiencing bleaching. Quantifying “sound science” and having “enough evidence” to satisfy all users may be impossible in a dynamic aquatic system. In the midst of the robust debate, Representatives on Capitol Hill from Florida introduced a bipartisan bill, H.R. 3310 titled Preserving Public Access to Public Waters Act. If passed, the bill would require the National Parks Service (NPS) and Office of National Marine Sanctuaries to obtain approval from state fish and wildlife agencies before implementing any closures in state waters to recreational or commercial fishing. With many non-fishing interests also wanting access to the federal waters within national parks and sanctuaries it raises questions whether state fishing authorities should have a final say over all citizens’ access to waters federally designated for heightened protection. During the 15 years of developing the new GMP, FWC provided input and actively participated in the NPS federal processes; even so obvious differences remain. The real decision now is which governing entity has the final decision making authority over the federal Biscayne National Park. During the upcoming year of NPS rulemaking to implement the GMP, finding common ground should be a priority, rather than litigation and legislation to encumber protection of the marine resources. At the same time in deep waters off New England, a region also with a strong fishing culture, anglers and commercial fishing interests are threatened with more closed waters. 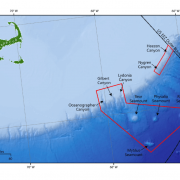 Three deep sea canyons—Oceanographer, Gilbert, and Lydonia Canyons—and four seamounts have been selected for a potential National Marine Monument designation based on their rich biodiversity of deep sea corals. The Oceanographer Canyon already benefits from a prohibition on commercial bottom fishing gear from fishing in the Canyon. Recreational fishing groups are advocating that because their fishing techniques do not cause harm to the deep bottom habitat where the corals are found, and because their fishing is aligned with conservation and generates tremendous funds they should not be restricted from the Monuments’ waters. Establishing the National Marine Monument is the result of the president’s exercise of the Antiquities Act, a tool used by many presidents. In 2006 President George W. Bush established the Papahanaumokuakea National Marine Monument that includes 140,000 square miles northwest off Hawaii, In 2009 President Bush also established the Pacific Remote Islands National Marine Monument, which President Obama expanded in 2014. Use of the Antiquities Act does not require the long processes used when developing federal regulations, including public input. Presidential use of the Act has been upheld by the U.S. Supreme repeatedly; only limited twice since1906, once to halt enlargement of Monuments in Wyoming and second to limit additional designations in Alaska of more than 5,000 acres. The robust debate surrounding the proposed designation of the Monument off New England coupled with fears many have that other designations may follow, Congressmen Walter B. Jones of North Carolina and Don Young of Alaska cosponsored Marine Access and State Transparency Act (MAST). Paralleling the Preserving Public Access to Public Waters Act, MAST would prevent current and future presidents from unilaterally establishing federal waters as national monuments and restricting the public’s ability to fish there. If passed, the law would require the approval of Congress and legislature of each state within 100 nautical miles of a proposed monument before designation could be implemented. If passed, the added layers of bureaucratic review by each state will delay and add costs to establishing marine Monuments and in doing so, could be costly to the conservation of the marine resources. 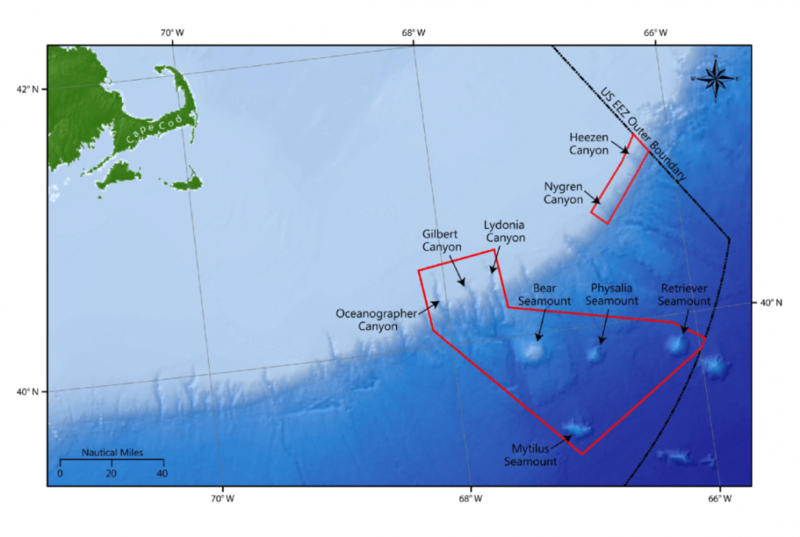 An exemption to allow recreational fishing in the deep waters of the New England canyons, where the gear cannot harm the corals, would seem to be reasonable.